The Seventh Edition of Construction Planning, Equipment, and Methods, follows in the footsteps of the previous editions by providing the reader with the fundamentals of machine utilization and production estimating in a logical, simple, and concise format. Our text features expanded coverage of building in today's global environment. Hundreds of photos and illustrations have been added to the seventh edition to make this dynamic text even more accessible to both students and professionals. 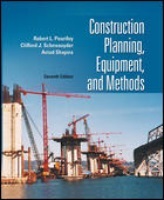 In addition, since technology is constantly evolving, this text provides an understanding of machine capabilities and how to properly apply those capabilities to construction challenges. The media package includes: Web-based exercises have been added to many chapters to draw attention to the expanding volume of information available over the Internet. The computer monitor icon in the text margin will direct you to the text website (http://www.mhhe.com/engcs/civil/peurifoy). In addition, extensive web resources are provided at the end of every text chapter.